Use of sunscreens has become a routine part of our lives as people have taken to heart the warnings about sun-damaged skin and skin cancer. Sunscreens are now added to many cosmetics and lotions in addition to dedicated products. Unfortunately, this has led to various allergic reactions to the chemicals found in sunscreens. Most of these allergic reactions represent contact dermatitis. Contact dermatitis is an itchy, blistering skin rash typically caused by the direct contact of a substance with the skin. There are two types of contact dermatitis, irritant and allergic. This difference is often difficult to tell apart and is not usually an important distinction to make. While contact dermatitis to sunscreens is not as common as allergy to cosmetics, it is not a rare condition. The reaction to sunscreens can occur anywhere the substance is applied on the body, although tends to be more common in the areas of the body with the most exposure to the sun. This is called photo-contact dermatitis. Photo-contact dermatitis usually occurs in a sun-exposed pattern on the body. These areas would include the face (but not the eyelids), the “V” area of the upper chest and lower neck, the backs of the hands and the forearms. The area of the neck under the chin is usually not affected. 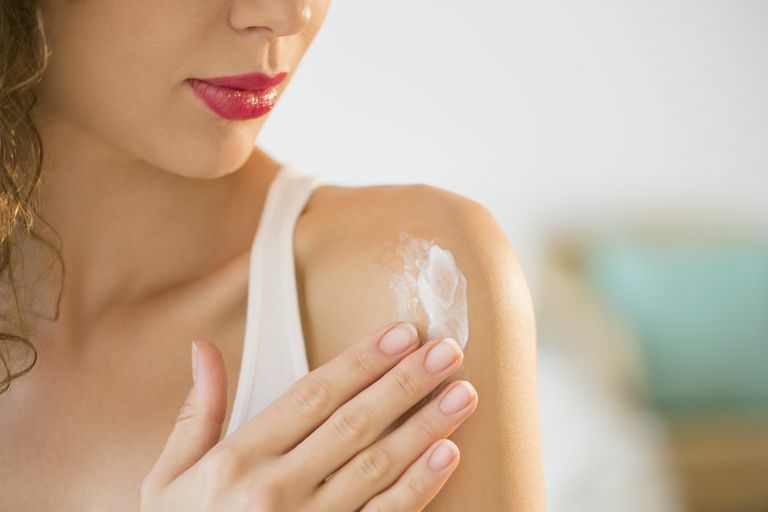 Contact dermatitis to sunscreens can occur as a result of an allergy to the active ingredients or to the fragrances and preservatives present in the product. Patch testing is an important part of the evaluation of contact dermatitis. Who Is at Risk for Developing Sunscreen Allergy? Chemical Absorbers: Most sunscreens absorb ultraviolet (UV) radiation (the energy from the rays of the sun) and turn this energy into a less dangerous form of radiation that causes less damage to the skin. There are sunscreens that absorb different types of UV radiation, such as UVA and UVB. Chemical absorbers include most of the available sunscreens that can be rubbed completely into the skin. Physical Blockers: These sunscreens reflect the sun’s radiation away from the skin so that it is not absorbed. Physical blockers include zinc oxide, the brightly colored sunscreens frequently used on the nose and lips of beachgoers. Many active ingredients are present in sunscreens that cause contact dermatitis. Some of these chemicals cause more problems than the others. Many sunscreens have multiple active ingredients, so it may be difficult to determine the exact cause without patch testing for the individual chemicals. The following are the most common active ingredients in sunscreens reported causing contact dermatitis. Para-Aminobenzoic Acid (PABA). PABA was one of the earliest ingredients used in sunscreens but now is rarely used due to the many side effects of this chemical, including contact dermatitis and its tendency to stain clothing. A number of chemicals related to PABA still used today, including padimate A and O. Many sunscreens are falsely labeled “hypo-allergenic” since they do not contain PABA, but can still cause contact dermatitis from other active ingredients. People allergic to PABA may be allergic to other similar chemicals, including para-phenylenediamine (found in hair dye) and sulfonamide (sulfa) medications. Benzophenones. Benzophenones have been used in sunscreens for decades, and are one of the most common causes of sunscreen-induced contact dermatitis in the United States. Other names for benzophenones include oxybenzone, Eusolex 4360, methanone, Uvinal M40, diphenylketone and any other chemical name ending with “-benzophenone”. Salicylates. Benzyl salicylate was the first sunscreen used in the United States. Common chemicals in this group used today include octyl salicylate, homosalate and any chemical ending with “-salicylate.” Salicylates are rare causes of contact dermatitis. Dibenzoylmethanes. These sunscreens have been used in the United States since 1997, and include the chemicals avobenzone and Eusolex 8020. They are frequently combined with other chemical absorbers in sunscreens. Octocrylene. Octocrylene is a relatively new chemical used in sunscreens but has been reported to cause contact dermatitis. It is similar to cinnamates and may be used together with cinnamate chemicals in sunscreens. Sunscreens For People With Sunscreen Allergy? The physical blocking agents have not been reported to cause contact dermatitis. These agents include zinc oxide and titanium dioxide and tend to come in heavier creams that do not absorb well into the skin. For this reason, some people do not like to use these agents, as they are less cosmetically pleasing. However, sunscreens containing these chemicals are a good choice for people with an allergy to sunscreens, or those with the concern of developing an allergy to sunscreens. Groot ACD, Roberts DW. Contact and photo contact allergy to octocrylene: a review. Contact Dermatitis. 2014;70(4):193-204. doi:10.1111/cod.12205. Wong T, Orton D. Sunscreen allergy, and its investigation. Clinics in Dermatology. 2011;29(3):306-310. doi:10.1016/j.clindermatol.2010.11.002.